Born in Matara, Sri Lanka, Dr. Jayaweera was a science journalist before pursuing engineering. He joined ECE@UNM in 2006. In recent years, his research has been focused on the notion of autonomous and wideband cognitive radios called Radiobots. Such radios may have the ability to interpret and self-adapt to any RF environment, over a wide spectrum range, to best fulfill the user performance objectives. He has published more than 150 journal and conference papers in wireless communications, signal processing and information theory with over 2500 citations and 3 best paper awards at IEEE international conferences. He is also the author of the 2014 Wiley book titled "Signal Processing for Cognitive Radios". He has been awarded fellowships at National Institute of Aviation Research (NIAR), Air Force Research Laboratory (AFRL) and National Research Council (NRC – Senior Fellow). 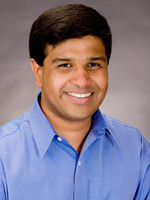 Currently, Dr. Jayaweera serves as an Editor of IEEE Transactions in Vehicular Technology. He is a senior member of IEEE. Wireless sensor networks (distributed processing, learning, estimation and coverage).